MicroFoundry is a new (2011) and unique system for hobby jewellers to cast Silver, Bronze and Gold items of jewellery safely at home using the 'Lost Wax Investment' method. No previous experience of casting metal is required. A free demonstration of melting / pouring any metal with a melting temperature up to 1100°C using MicroFoundry is offered to 2 visitors maximum (by appointment ) at CV5 8BU; e-mail richard@compucutters.co.uk for a convenient time/date. 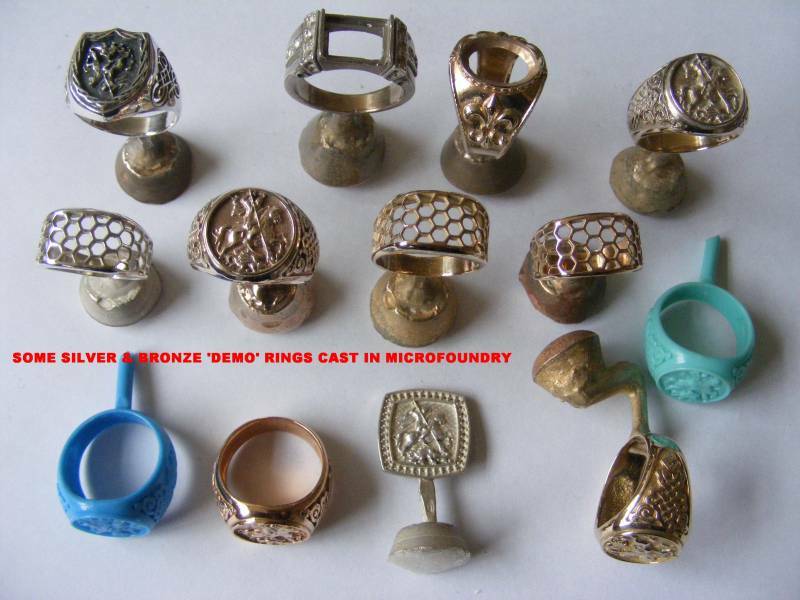 Any item that can be carved, moulded or copied in wax can be reproduced in precious metal using MicroFoundry. Note, Wax patterns can be hand crafted, bought as 'ready to cast', machined or 3D printed etc. The system is designed and made in the UK for crafting items of jewellery up to 6cc in precious metals, which is ample capacity for rings, charms, pendants and represents excellent value at 350 GBP + 26 GBP postage in UK (7Kg).